FORT WAYNE, Ind. -- The Fort Wayne TinCaps gave away $10,000 in gifts and prizes at Parkview Field following their game on Thursday night in celebration of hosting their 4,000,000th fan. Out of the crowd of 6,269 fans that saw the TinCaps beat the South Bend Cubs, 5-1, Amy Johnson of Kendallville, Ind., won the team's contest to be designated at random as the 4,000,000th fan. As the grand-prize winner, she won $4,000 in TinCaps hospitality, season tickets, merchandise, and more. Amy was at the game with her husband, two teenage sons, and two of their friends. 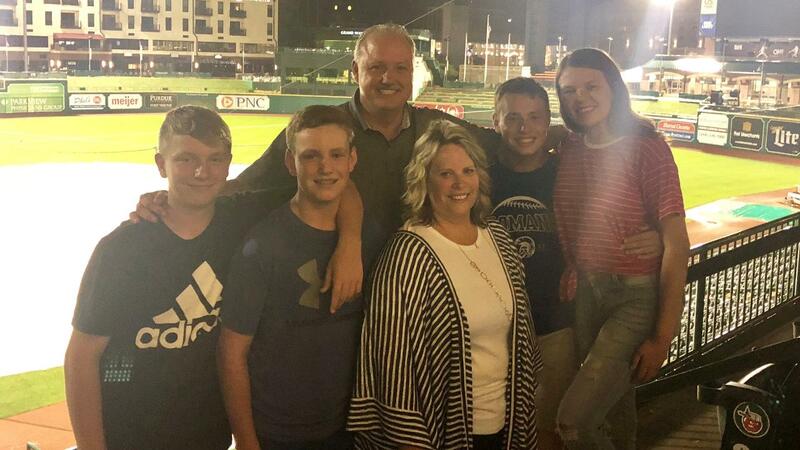 Despite living about 30 miles north of the ballpark, the Johnsons have been longtime supporters of the TinCaps and attend multiple games every season. They say they'd likely have had season tickets in the past if not for their own busy youth baseball schedule. But now, season tickets, and more, can be a reality. "This is an amazing night for us," Amy said after finding out she had won. "We love coming to TinCaps games at Parkview Field. We weren't thinking we'd be so lucky as to win, but now we can't wait to cash in our prize for merchandise, tickets to games, and, well, we still need to figure out exactly how we'll use it all, but we're excited to do so." "We can't say thanks enough to each and every one of our 4,000,000 fans who've joined us at Parkview Field over the last decade," said Michael Limmer, TinCaps Vice President for Marketing and Promotions. "We're thrilled that Amy and her family won our contest, and glad we were able to have 30 other winners as well to celebrate this accomplishment for our organization and the entire community. Now the work starts to 5,000,000." As has become customary, this season the TinCaps rank second out of 100 Single-A/Short-Season Minor League teams in attendance (behind only Dayton). The team has drawn 347,513 fans so far, averaging 5,605 through 62 openings. Fort Wayne's attendance is also higher than 27 of 30 Double-A clubs and 13 of 30 in Triple-A. In addition to the excitement in the stands, on the field, the TinCaps are currently at the top of the Midwest League Eastern Division second half standings. If the season ended now, Fort Wayne would qualify for the Midwest League Playoffs for the ninth time in 10 seasons. There are 18 games remaining in the regular season, which concludes on Labor Day (Sept. 3). The TinCaps still have four remaining regular season dates at home: Friday, Aug. 17 (Harry Potter Night), plus the final homestand of the year, Aug. 29-31. Fans can purchase tickets online at TinCapsTickets.com, by calling 260-482-6400, and at the Parkview Field Ticket Office.